This is an example of a mesomorphic dicotyledonous foliage leaf. The midrib contains a single, large collateral vein. Here and on the lamina the upper epidermis (ADE) has a thick cuticle, the lower epidermis (LE) has a much thinner one - why do you think this is so? 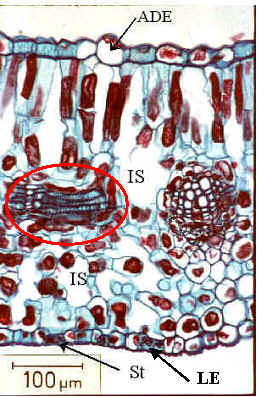 The two veins that you can see in this micrograph are embedded between the palisade and spongy mesophyll. They are therefore classified as minor veins. The vein on the left (inside the red ellipse) has been cut obliquely, and will join the one on the right at some point. Click here to see an image of guard cells as seen with the transmission electron microscope.